It’s the first time Radiohead has granted a worldwide license for “In Rainbows” to an online Web music site. It’s made possible through the “one stop” digital licensing platform that Radiohead and publisher Warner/Chappell Music created at the end of 2007. The “one stop” strategy enables rights users worldwide to secure from one destination all the necessary digital rights from both the artist and publisher. See also: Radiohead ends experiment, heads for traditional distribution. What it a success? 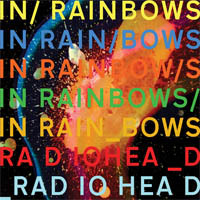 Since the debut of “In Rainbows,” Radiohead has released the album in physical form (January), has undertaken a mammoth worldwide tour (this spring/summer), and for the first time ever made its back catalog of recording available for sale (in June) on iTunes, the leading online distributor of legal digital music downloads. Radiohead’s bold distribution strategy for “In Rainbows” has caught the attention of publications worldwide and is believed to be — along with similar strategies by the band Nine Inch Nails — the spark allowing well-known artists license to experiment with new forms of distribution, shaking up even more the already-shaken music industry. After Last.fm, what’s Radiohead’s next move? Radiohead ends experiment, heads for traditional distribution. Was it a success?